I would like to welcome you to join us for the 16th annual SGGA! This event is held annually on the last Saturday in July. The location changes each year. I will be hosting the conference this year in Lexington, Kentucky, my home state. Planning has been underway since early August 2013. The hotel is booked and paid for, conference and activity rooms have been assigned and layouts drawn, a tentative itinerary is in place, speakers are being contacted, supplies are being gathered. We now have 4 months until the event, and it is time to ramp up! The room rate will be $89.99 + tax for your choice of two double beds or a king. The hotel has waived the pet fee for sugar gliders ONLY. Please ask about fees for other pets when making your reservation. This rate includes a full breakfast for 2 guests per room. There will be a charge of $6 for breakfast for each additional person. Each room will have a microwave and refrigerator, some with a small freezer. The hotel has an indoor and outdoor pool. Children ages 10 and under are welcome to come. We will be offering optional child care for Saturday during the conference from 9am – 6pm. We have a room available with tables, a couch, a bathroom, TV and DVD player, There will be a charge per child for the day, including lunch, to be determined based upon the number of children signed up. Hourly rates will not be available. We may consider ½ day rates, but that is not guaranteed at this time. A form will be available at the registration table to sign up your children. We will ask for your name, cell #, room #, permission for supervised swimming, etc. Your child will ONLY be released to the person(s) indicated on the form. The Friday Night Welcome Party will be hosted by Trina Finch on behalf of the Facebook group Sugar Glider Fanatics. It will be held in the Hospitality Suite of the hotel on Friday, July 25th from 7pm to 9pm. This is a great way to start the weekend. We look forward to seeing you there! There will be a Craft and Sewing Room set up on Friday, July 25th from noon until a time to be determined. Denise Rainwaters/minkasmom has graciously agreed to coordinate this for us. 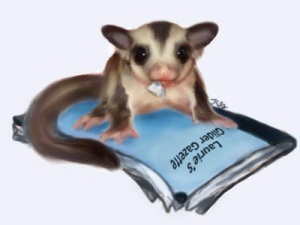 You will have a chance to learn basic safe sewing techniques for sugar glider items. Toy-making supplies, fleece and sewing machines will be available. Donations are being accepted for door prizes, goodie bags and a raffle to benefit Lucky Glider Rescue and Sanctuary in Van Alstyne, Texas. Melissa Cowles, aka ssdreamsicles, aka Treasured Gliders is coordinating donations. We greatly appreciate our generous vendors! Please visit the website at http://sgga.info/ for more information, to register to attend or to vend at the event. We have had a few technical issues with the website, which should now be resolved. • Click on the “Technical Difficulties” button on the left sidebar of the website if you should encounter any website issues. An email will be sent to the WebMaster, Julie Hammock. • Click on the “Contact Us” button on the left sidebar for any general questions or concerns you may have about the SGGA. An email will be sent to Bourbon at sgga@sgga.info . I do not receive either of these submissions, Attendee Registration Forms, Vendor Registration Forms or PayPal payments. Feel free to contact me directly via private message or by email to n_c_ford@yahoo.com if you do not get a timely response to your website inquiry. I would like to ask for your input on the theme for this year’s SGGA. Kentucky is known for its horse farms, thoroughbred racing, bourbon distilleries, the longest cave-system in the world, tobacco farming…. and basketball! I have been throwing ideas around in my head, and thought horse racing would probably be of interest to most. What do you think? It's that time again! The SGGA is only 4 short months away and I could not be more excited! I know everyone shares in my excitement! Its now time for some fun planning and preparation! Their will be door prizes and raffles to have oh so much fun with. I will be sending out a email to our wonderful vendors asking for their help with donations. Thank you in advance to all our wonderful vendors for making this another great SGGA! I took over the Webmaster duties for the SGGA website and vendor/attendee registration forms a few days ago. Please bear with me as I put all of the pieces of my puzzle together. I will be contacting vendors to update the page. There are 13 vendors registered and I have matched up 4 of them to payments. Only paid vendors will be officially "registered" and added to the vendor page. Right now I have only 20 vendor tables available. They are on a first come/first paid basis to make it fair to everyone. I cannot hold unpaid tables. Calling all artists out there! It's time to get creative and see what you can come up with for the 2014 SGGA Logo Contest. The theme this year will be racehorse-related. Kentucky is the home of one of the most well-known horse races in the world, the Kentucky Derby. Lexington, in the heart of the Bluegrass regon, is known as the "Horse Capital of the World". 1. Must be hand drawn, not computer generated images. 3. Colors should include some combination of RED, WHITE, BLACK or ROYAL BLUE. 4. Must be willing to make minor changes if required. 5. Must be a good quality image. No cell phone pics of your drawing. Creator of the winning selected Logo design will receive a Free 2014 SGGA T-Shirt. We are looking forward to seeing your creations! Are you ready to order your SGGA 2014 t-shirts, car magnets, jewelry and other goodies? CafePress has been updated and here is the link to order: http://www.cafepress.com/sgga Please send an email to sgga@sgga.info if you would like a special order of an item or design that is not listed. It was an honor to host the 2014 SGGA. It was a huge success. We had a great turnout and the feedback so far has been positive. It is time to officially wrap up the 2014 SGGA and start planning for next year. This was definitely a team effort. I was humbled by the outpouring of support and grateful to all who contributed to the success of the 2014 SGGA. Thank you to all of our vendors who generously donated door prizes and raffle items. The tables were full of beautiful, well-made glider goodies. The vending room was packed. I hope that sales exceeded your expectations and that you enjoyed spending your weekend with us. Amanda No Joe on behalf of Gliders of Today did a wonderful job gathering donations for and assembling the centerpieces raffled off to support Lucky Glider Rescue & Sanctuary. Thank you so much Amanda! Shelly Sterk, my best friend, came through with whatever I asked of her and more. She filled in for a no-show speaker, folded programs, helped set up the conference room, MC’d giveaways, generously donated door prizes, and kept me grounded. I love you girl! Kristen Scarborough planned the Friday Night Welcome Party with less than one hour’s notice due to a no-show host. Great job Kristen! Thank you so much for taking over at the last minute! Mary Mattern was in charge of the Registration Tables. The line was long, but was kept moving with her helpers Kim Colfer, Sari Kitch and Erika Hutchins. I hope I didn’t forget anyone! Mary also donated the personalized purple pens for the goodie bags. Thank you so much, Mary! Tammy Dahms took over the stuffing of the goodie bags, assembled the kids goodie bags, put together the HQ cage to be given away, helped set up the conference room and anything else we asked her to do. You are awesome, Tammy! I know it was hard on you physically and I appreciate all of your help. Melissa Cowles contacted vendors for donations, helped set them up in the conference room, did the nail trimming demo and was our official photographer for the weekend. Thank you Melissa for all of your hard work! Kimberly Jenkins arranged child-care for us. There was quite a bit of stressful last-minute scrambling, but it all worked out! Thank you Kim! Kim Colfer worked the registration table and did the nail trimming demo with Melissa. Thank you Kim! Lucy Letton worked with the Chamber of Commerce to put together the welcome packets given out at the Hotel Registration desk. She loaned us the projector for the presentations and was there in Lexington to help with whatever was needed. Thank you Lucy! Amanda Miller helped with the vending room setup. It is so good to see you return to vending your unique crocheted items! Thank you for your help Amanda! Bobbi Tindle picked up the Grubco order, with the mighty mealworm donations. Thank you Bobbi! Our gliders appreciate your help! David Watkins made a stand for one of my demo wheels. He also generously donated 4 wheels for door prizes and raffles. Thank you David! Denise Rainwaters, what can I say? You were in charge of the sewing and craft room, along with Jonalle Snay, and it was a total success! We will definitely be continuing the tradition. You also did the e-jacket and e-collar demo. Thank you so much for everything! Sherri Lamb, I am thrilled that you were able to come at the very last minute! Thank you for your help, and for doing the Photography talk. Melinda Collins, my daughter and my friend. I am so grateful for you. Thank you so much for selling and keeping track of the raffle tickets. That was just about an all-day job. Thank you also for all of your help with the vending room, helping vendors and guarding the entrance! I could NOT have done it without you. Last, but certainly not least, my dear friend Bourbon. You are truly an inspiration and I thoroughly enjoyed working with you this past year. We were like a well-oiled machine and got a pretty good routine down. You told me often that you appreciated all that I was doing. You were the voice in my ear when I was ready to just throw my hands up in the air that said, “You are doing a great job.” You made sure that we had Plan B and sometimes Plan C in place. You were my constant reminder that, “It is what it is.” I am proud to call you my friend. I will help in any way that I can for the 2015 SGGA. We’ve got this! I apologize in advance if I left anyone out. It doesn’t mean that I appreciate you any less! Thank you most of all to our guests! You are the reason for the SGGA. I hope you enjoyed your weekend, learned at least a little something, met some new friends and put some faces to names you’ve met online. 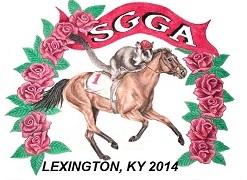 Please join us for the 2015 SGGA in Lexington, KY next year! » Are Kentucky Wonder beans supposed to be flat?